प्रभु से कुछ छुपा है भला! दरअसल, सभी लोग सिर्फ श्रीराम का गुणगान करते थे लेकिन प्रभु चाहते थे कि लक्ष्मण के तप और वीरता की चर्चा भी अयोध्या के घर-घर में हो ॥ अगस्त्य मुनि ने कहा – क्यों न लक्ष्मणजी से पूछा जाए ॥लक्ष्मणजी आए प्रभु ने कहा कि आपसे जो पूछा जाए उसे सच-सच कहिएगा॥प्रभु ने पूछा- हम तीनों चौदह वर्षों तक साथ रहे फिर तुमने सीता का मुख कैसे नहीं देखा ?फल दिए गए फिर भी अनाहारी कैसे रहे ? और 14 साल तक सोए नहीं ?यह कैसे हुआ ? इन दिनों में हमें भोजन की सुध कहां थी॥ विश्वामित्र मुनि से मैंने एक अतिरिक्त विद्या का ज्ञान लिया था- बिना आहार किए जीने की विद्या. उसके प्रयोग से मैं चौदह साल तक अपनी भूख को नियंत्रित कर सका जिससे इंद्रजीत मारा गया ॥भगवान श्रीराम ने लक्ष्मणजी की तपस्या के बारे में सुनकर उन्हें ह्रदय से लगा लिया.? राम ? राम ? कहाँ तो एक भोगी डिप्टी कलेक्टर और नाना साहब औलिया का तमाचा लगा तो ईश्वर के रास्ते चलकर बन गया सिद्धपुरुष ! The Peshwai rally of the Anand Akhada took place amidst much fervour at Trimbakeshwar recently . 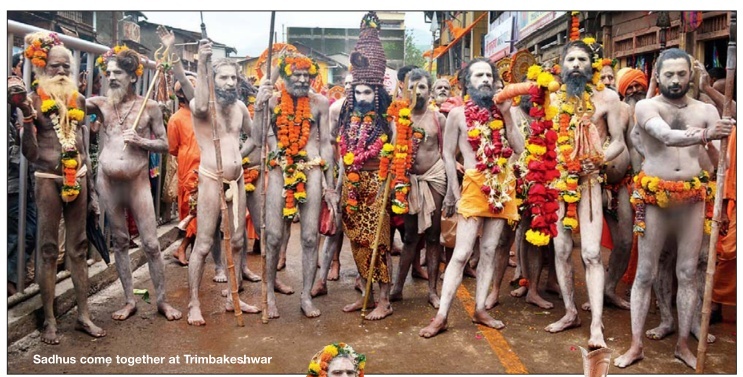 Naga sadhus clad in loincloths, garlands and rudraksh beads with bhasma smeared over their bodies walked in the rally . 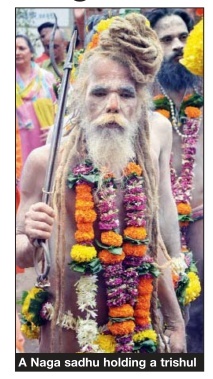 For many onlookers, this was their first time watching the dumru and trishul-carrying sadhus walking on the streets. visits one of the twelve jyotirlings at Trimbakeshwar Temple in Nasik, Maharashtra. This temple is located at the source of Godavari river which is considered sacred within Hinduism. The extraordinary feature of the jyotirlinga located here is its three faces embodying Lord Brahma, Lord Vishnu and Lord Rudra. The place which defines the purity of gold, the beauty which reflects in the water is the Golden Temple of Amritsar. Deepti Bhatnagar visits the temple and tells about the Sikh religion and Sahib. Further, she tells about Guru Nanak, Guru Granth Sahib, Akal Takth, Har Mandir Sahib, Darbar Sahib, Bir Baba Budha, Dukh Bhanjini Devi, Baba Deep Singh. Deepti Bhatnagar tells about the eight distinct idols of Ganesha on her Ashtavinayaka yatra. She tells about Mayureshwar Temple, Siddhivinayak Temple, Ballakeshwar Temple, Varadavinayak Temple, Chintamani Temple, Girijatmaj Temple, Vighnahar Temple and Mahaganapati Temple.